BIKE CRASHES HAPPEN. HERE’S A STEP-BY-STEP GUIDE TO CHECK YOURSELF AND YOUR BIKE BEFORE RIDING ON. As regular bike riders, we know that if you ride, at some point you’re going to have a bike crash or be witness to a bike crash. Knowing this, it’s best to be prepared. The first thing you want to do after a crash is avoid scrambling to your feet. Before you get off the ground, take a quick self-inventory and make sure you don’t have any major injuries. Assuming all of your parts are where they should be, for instance, all of your limbs attached and intact move quickly to a safe spot off the road or out of the way of other riders and continue assessing. Stay calm and call 911 immediately. ALWAYS file a Police/Sheriff/State Patrol report. Be aware that some officers are not current on bicycling laws. Don’t apologize and don’t assumer you’re “OK.” Adrenaline will have kicked in and you may not realize the extent of your injuries. Photograph your visible injuries, and any damage to your bicycle, helmet, clothes, and other bicycle gear. Record license plates, business cards, witness contact information, insurance/registration paperwork, reporting office bades, etc. When giving a statement to reporting officer(s), stay focused on the facts. Accurate information and measurements of the scene are crucial. Get examined by a medical professional. Remember, some injuries may not be apparent at the scene. Download and save any digital data from your bicycle computer or smart phone. DO NOT post about your collision on social media, as your social media will be monitored by insurance companies. Statements of photos posted can be used against you. Purchase a new helmet. Save the old one until your injury claim has concluded. Bicycle crashes happen. If it happens to you in Nebraska, sticking to these guidelines will help protect your rights. If you have questions call Inserra | Kelley | Sewell and we’ll walk you through everything. 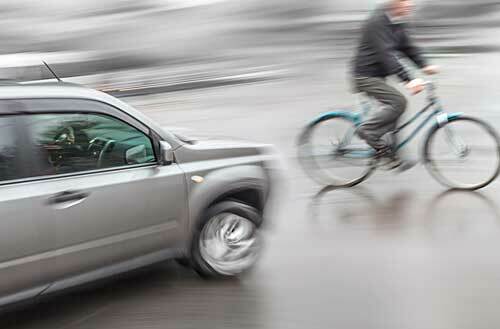 In the end, the most important lessons we have learned is that most bicycle collisions have simple causes. Keep the rules of the road in mind. Stop at stop signs and obey traffic signals. Be aware of car and truck blind spots. Sidewalk riding often violates local law and can be unsafe. Use bike lanes where available. Use lights on your bike when riding early in the morning or late at night. We work hard for our clients by listening to their needs, focusing on their health, and then fighting aggressively for the help they need. Below are testimonials from some of these great clients. Contact us to see how we can help you. If you are looking for an attorney, don’t make the same mistake I did. After a terrible experience with one of Omaha’s largest firms, I soon realized why they have to continuously advertise on the radio and television. Inserra & Kelley’s personal and hands-on approach is a much better way. Craig Kelley has handled several cases for my family and I, all of which I am convinced were handled fairly and appropriately. I would highly recommend Inserra & Kelley to anyone. Thank you, Craig Kelley. I am very pleased with the way that the Inserra & Kelley law firm handled my case. You are a very good law firm. I was treated as if I was someone very important. I felt as if they were very concerned about my well-being and wanted to do the very best for me. Inserra & Kelley, Attorneys at Law, work for you and will do all they can for you. You are important to them. I would like to express my complete satisfaction and offer a recommendation of the services of Inserra and Kelley Law Firm. On Dec 10, 2010 I was involved in a motorcycle/motor vehicle accident. I enlisted the help of Craig Kelley almost immediately after the accident because he was recommended as a motorcycle accident specialist. I was temporarily unable to leave my home due to my injuries but Mr. Kelley took time out of his personal schedule to visit me in my home to begin the preliminary paperwork to initiate litigation against the rental car company involved who denied responsibility for my accident. At that time Mr. Kelley advised patience when litigating issues of this type. He gave me an overview of the process and expressed great confidence that his efforts would result in a favorable settlement. He couldn’t have been more correct on both counts; my case ultimately lasted two years but the patience Mr. Kelley advised resulted in the settlement he predicted the very first day we met. At all times during this two year period Mr. Kelley was responsive, straightforward, and accessible. All the while being aggressive with at-fault party’s insurance carrier. He went out of his way to achieve his utmost for my wife and I, for which we are very grateful. Inserra and Kelley processed all of my medical bills to correct insurance companies. I no longer live in Nebraska and hope to never need the services of a personal injury law firm again. But if I did, I would without hesitation seek out Inserra and Kelley and Mr. Craig Kelley himself. Thank you for your assistance on handling my claim. I was satisfied with the settlement and with the way you and your office handled this matter. Just wanted to say thank you all so much for everything you’ve done related to my case. I feel fortunate to have learned about your firm and that you took my case. You believed in helping me and I’m grateful. The experience of my injury and recovery was difficult, but knowing I had great legal support behind me made a difference. So, thank you all so much!! I have had several cases with Inserra Law. All cases have been handled promptly, fairly and professionally. I never had to worry about not receiving proper follow up with my medical needs. Craig Kelley always took care of whatever was needed in order to receive the care and compensation required. I have referred several clients and will continue to refer clients to this firm. I am very pleased with the way John Inserra took care of my case. From the first time we met, I knew I had chosen a very trustworthy firm. It is always a pleasure to know when I have a question; I can always get a fast, knowledgeable answer. John is very good about explaining everything in “common terms” and is very good about handling things in a professional manner. Inserra & Kelley will always be my number one recommendation. I was so pleased to have chosen Craig Kelley as my legal counsel. The professionalism of Mr. Kelley and his staff made me feel comfortable and secure in knowing he would do all that was legally necessary to achieve a positive outcome. Through his diligence and hard work, my case was successful. Not only did I have outstanding representation; but I also gained a friend. My personal injury case was handled in a very professional and courteous manner. The settlement that was done outside of court was very substantial and quite satisfactory. I would highly recommend the Inserra law offices. They did a fantastic job for me. I am very satisfied the way you and your staff handled my claims, especially all the time you put into it. I most certainly will refer you to friends of mine if they need a very reputable and dependable law firm as yours. I know there is no better law firm than yours. I have always found the Inserra Law Firm to be quick and responsive to my questions and needs as they would arise regarding personal injury. I always felt John Inserra’s council was professional and accurate for my needs. Paralegal, Randy Mendlik, was very helpful on several occasions. One appreciates a law firm showing personal concern for their clients. John and staff are great to work with. They were always there to answer any and all questions that arose. I was very pleased with the services of Inserra Law Offices. They were very professional. I received a great in-service settlement. I was also pleased with investigator, Jim Webster, as he was always in touch with me to see how I was before and after my surgery. The Firm worked hard for me and I would recommend their services to anyone! I am thoroughly pleased with everyone at Inserra Law Firm. They won both cases that I had with them, including one appeal. I don’t think anyone could have done better! The Inserra Law Firm is a very professional, genuinely concerned firm that I would recommend without hesitation to anyone! I would use their services again, if needed, with no reservation whatsoever. Inserra Law Offices has acted as my legal counsel on several occasions. Each time they represented me I was very pleased with their work. I look forward to a continuing business relationship and friendship with Inserra Law Offices. Inserra & Kelley was like a God-send to us! We would like to take the time to send my thanks to Inserra & Kelley for their help with the motor vehicle accident we had upon our arrival in Omaha in 2010. Not knowing a soul here, your office was a God-send to us. You helped us get our vehicle repaired and after analyzing our insurance coverage, you helped us find the proper medical help for our injuries. Craig was a sympathetic and compassionate attorney. He shielded us from harassing calls from the insurance companies that allowed us to focus on our recovery from our injuries. Inserra & Kelley utilizes a specialized team approach, which meant at every step of our case, we had an expert to guide us. It is with great satisfaction that I will gladly refer your firm to anyone. Inserra & Kelley doesn’t treat you as just another client. Even though you don’t see most of what they do, you know they are working hard to do what’s best for you. Thanks again for all of your help. In January 2007, while walking through a parking lot, I was hit by a motor vehicle. I sustained a tibia plateau fracture, which caused me much pain and suffering. It altered my life in ways I never thought possible! Eighteen months later, after two failed surgeries, I found Craig Kelley of Inserra and Kelley Law Firm online. Prior to contacting Craig, I had consulted with two other attorneys that were neither helpful nor encouraging. Mr. Kelley was very knowledgeable about my injury and future medical treatment that I would need. He and his staff were always very professional and responsive to my needs, returning my calls the same day, two at the most. Craig is very aggressive and a real go-getter. He took the time and was dedicated; seeing my case through. We reached a settlement with my insurance company beyond my expectations, without going to court. I am very grateful to Craig and his friendly professional staff for supporting and helping me through a very difficult time in my life. I would highly recommend Craig Kelley and Inserra Kelley Firm to someone with a personal injury without hesitation. If the occasion would arise that I would need legal representation in the future, I know that Craig would be there for me. Contact us now for a free, confidential consultation on your personal injury case. We focus on healing, then get results.